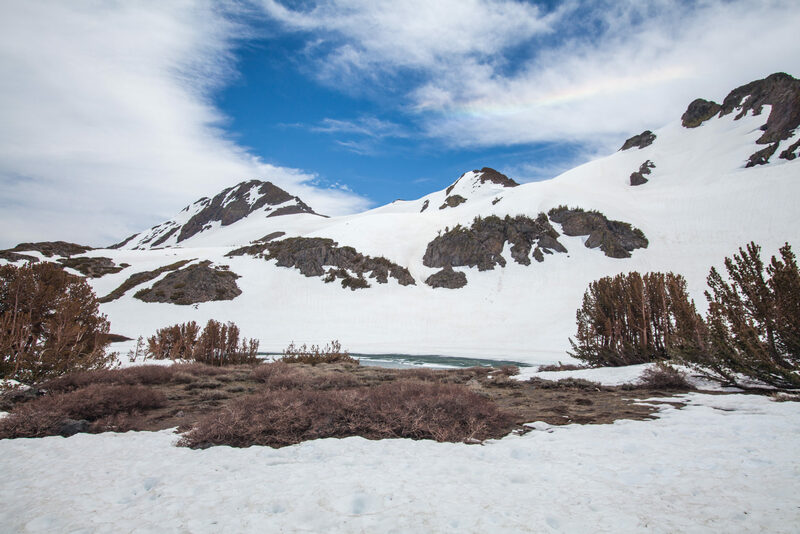 The Carson Pass Management Area requires permits for overnight stays. 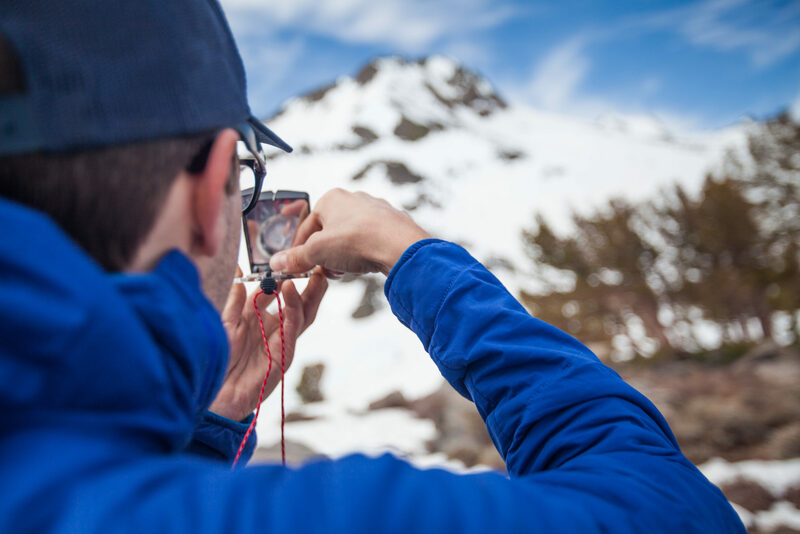 They are issued at the Carson Pass Management Station or at the Amador Ranger Station. I was coming up late Friday night, so I called earlier in the day to grab a permit spot for pickup on the way to Carson Pass. When there’s no snow on the ground, camping is only allowed in designated campsites at the lakes. 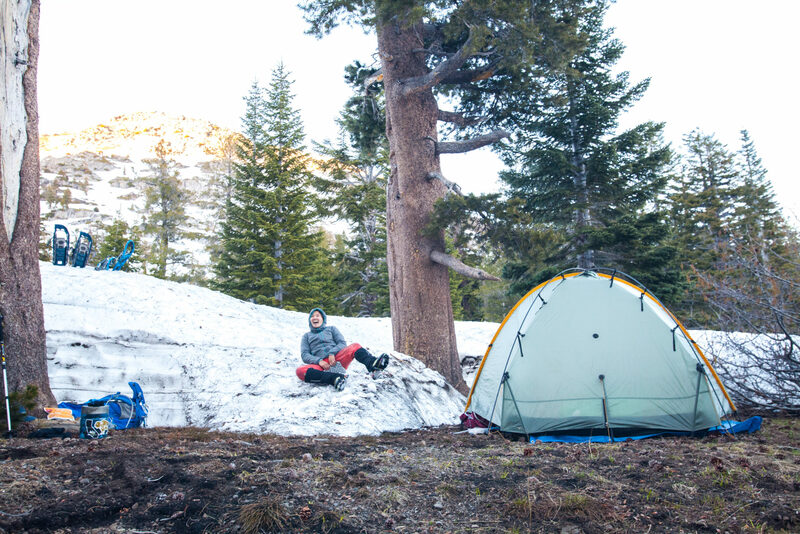 When there’s at least a foot of snow on the ground, snow camping is permitted everywhere. Luckily for us, there was a lot of snow. We hiked in about half a mile, probably less, to throw up the tent. My body does not do well at 8000 feet or higher. With a pounding headache, I quickly fell asleep in the winter wonderland. Morning came and we woke up with the sun. The night before we’d hiked in willy nilly so after packing up our little camp, we took a look at our maps to plot our route and figure out where we were. The trail was under snow, that much was for sure. We were still close to 88 and we could see Red Lake Peak behind us. 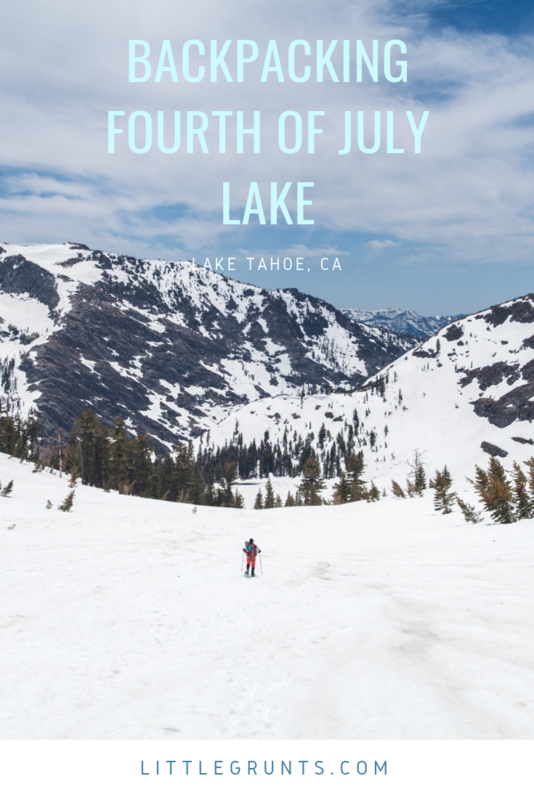 Want other trips like Fourth of July Lake? Head to Aloha Lake in Desolation Wilderness. Go across the street and off trail to Meiss Lake. 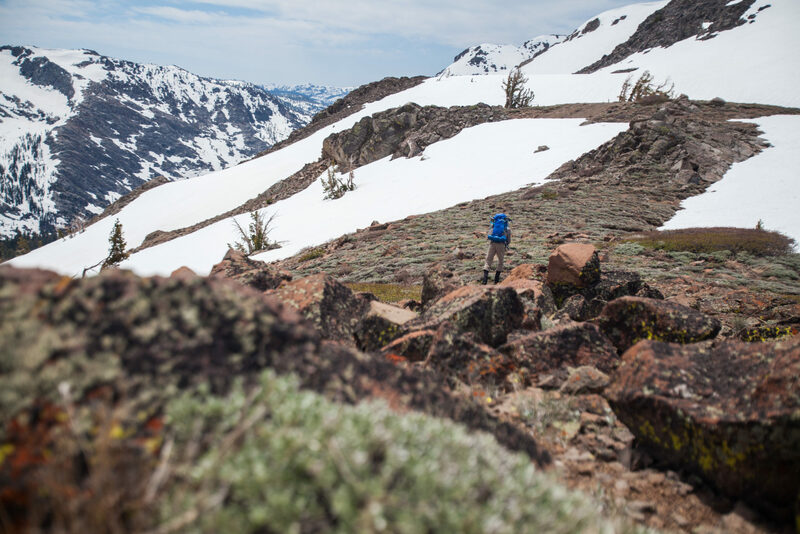 Get even more obscure with Granite Lake in Emigrant Wilderness. We decided to roughly follow the trail on the map by heading out to Winnemucca Lake. From there, we’d stop and make breakfast, then skirt the base of Round Top Peak, up to Round Top Lake. After Round Top Lake, we would traverse around the Sisters and hit a saddle between Fourth of July Peak and the Sisters. 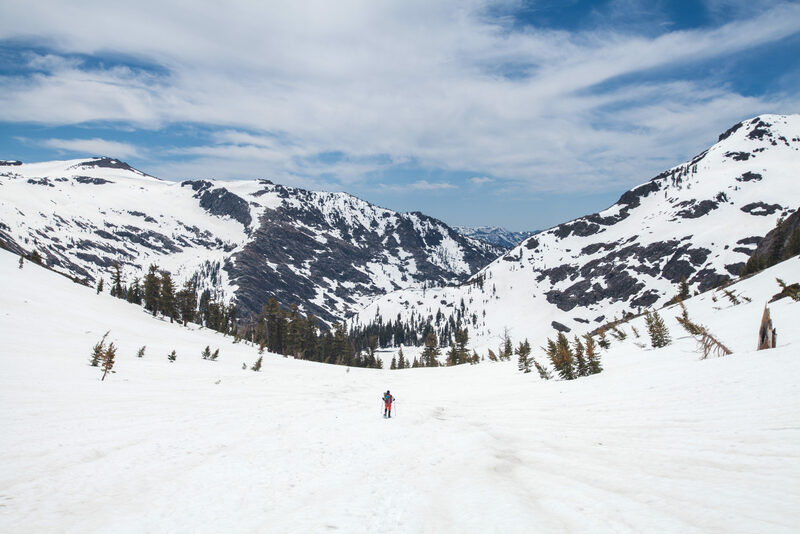 From the saddle, descend down into the Fourth of July Lake basin. We ended up at our destination around 1pm on Saturday, leaving lots of time for activities. After a delightful 2 hour nap, we wandered around the lake a bit, built a snowman and sledded on my Therm-a-Rest Z-Seat. I wore snowshoes the entire first day, but they weren’t necessary. Day two, I hoofed it in just mountaineering boots. We saw folks mainly near Winnemucca Lake. There were lots of people out climbing Round Top Peak and skiing down. Once we hit Round Top Peak, we only saw two other people until we came out. Traversing around the Sisters to the saddle to Fourth of July Lake was a little spicy. The snow was steep, and soft. 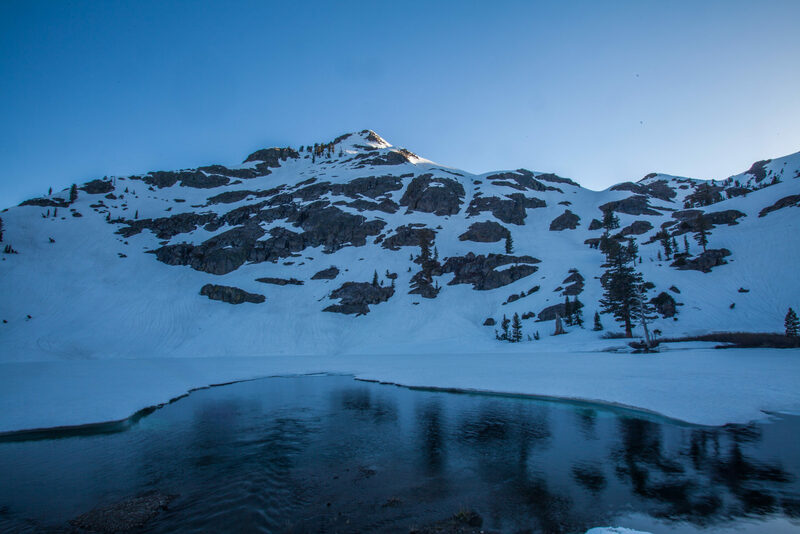 If we had ice axes, the glissade to Fourth of July Lake would have been glorious. At the beginning of June 2017, all of the lakes were still mostly frozen over and covered in snow.